3 Favourites | The Body Shop / Gee Whiskers! I know that most beauty bloggers, if not all beauty bloggers, have something from The Body Shop that they never go without. For me I have 3 products that I always ensure I have in my cupboard and am never without. 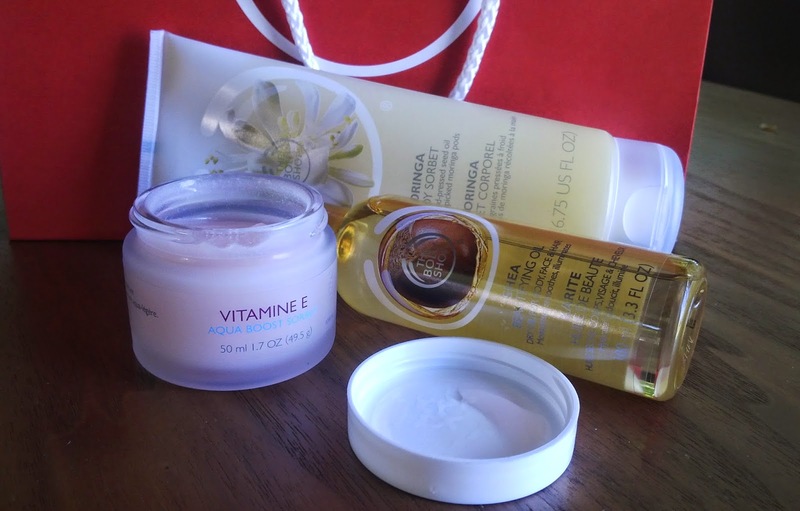 They are the Vitamin E Aqua Boost Sorbet face moisturiser, Beautifying Oil and Body Sorbet. I've already written a full review on this amazing hydrating moisturiser (click here to read it). I love everything about this product from the packaging to the consistency of the product. It instantly hydrates and moisturises skin, has an amazing moringa fragrance and is gentle on the skin. The best part is that it only costs R135 a jar. Another product I have written a previous post on (click here to read it). I use this everywhere! It is perfect to add to any moisturiser to amp up the hydration. Also fantastic to use on the ends of your hair, on chapped skin and any area that needs a little tlc. Because this is a dry oil, it won't leave an oily film on your skin. The fragrance also leaves a nice warm scent on your skin that isn't overwhelming at all. At only R120 a bottle this stuff is super affordable and super effective! This body sorbet has the same consistency as the Aqua Boost Sorbet with very similar benefits. I tend to always go for the moringa fragrance because it is soft and feminine. At R110 it is a bit more then your average body moisturiser but this isn't just an average moisturiser. It moisturises skin well, leaving skin soft and smooth. Because this is a sorbet, it is very light and doesn't leave you with any greasy or heavy feeling on your skin. To me this is a summer time must have! The best thing about The Body Shop is that they often have sales or specials on the products in store. When you time your purchases and stock up on items, you can pick up your staple products at basically half the price at times. So keep your eyes open. These are such great the body shop products!! Definitely want to try them ..